We are back for another exciting blog hop with another AMAZING stamp company. This week we are partnering with Avery Elle and we have an amazing line of inspiration for you. Join us today for Day 2 of this week-long blog hop. Throughout this week, you will learn more about Avery Elle’s amazing line of products and how you can use them with Add a Little Dazzle Craft Metal Sheets. They have so many fun products and they are a perfect fit with our craft metal sheets. Let the fun begin! It’s time for Day 2 of the Add a Little Dazzle and Avery Elle Blog Hop! Both design teams have come together to bring you an exciting week of inspiration using Avery Elle Stamps and Dies with Add a Little Dazzle Craft Metal Sheets. We have a mixture of projects so get ready for an amazing line up. So after you check out this post and leave a comment, make sure to visit Add a Little Dazzle for the rest of the blog hop and for a chance to win a prize pack. The background has been stamped in Avery Elle Aquamarine with the Cross Hatch stamp from Avery Elle’s Woodgrain & More. Next I embossed a piece of Baby Blue craft metal. I am a sucker for embossing these metal sheets…love, love, love the look! The color of the metal and the pigment ink from Avery Elle look awesome together! It just so happens that I have some of a lot of Avery Elle’s pigment inks…love the quality! The sentiment has been stamped on some paper from my stash. It’s something that I made using water colors and a stencil. Then I used the Simply Said Love die for my die cut and finished my card with a smattering of sequins. Be sure to leave a comment on the Avery Elle Blog, Add a Little Dazzle Blog, and each of the Design Team Member’s Blogs each day for a chance to win a prize pack from both companies! You must leave a comment on all blogs. You have until Sunday, October 5th to enter. The winners will be announced on Monday October 6th. BE SURE TO VISIT AVERY ELLE AND ADD A LITTLE DAZZLE FOR THE REST OF THE HOP LIST! Avery Elle and Add a Little Dazzle Blog Hop Special! 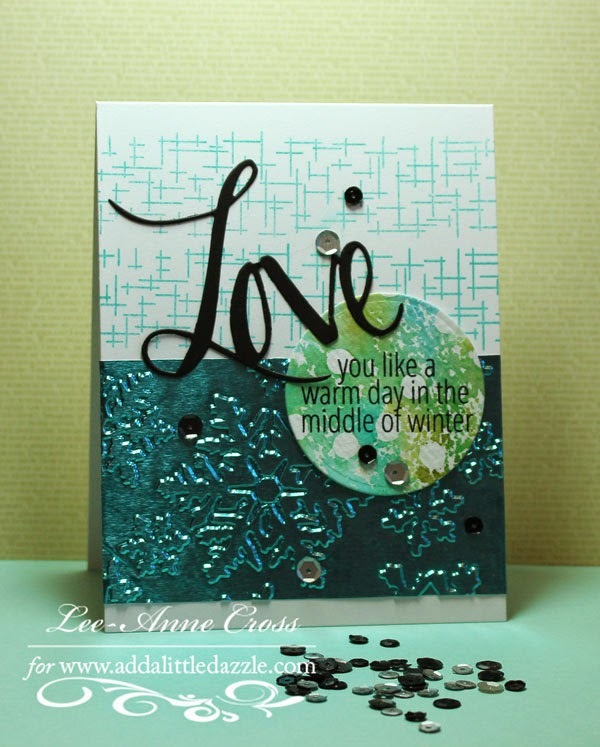 During this week’s blog hop, we are offering a special pack of Add a Little Dazzle Craft Metal Sheets. This pack includes metal sheet colors that the Dazzling Diva Design Team will be using during the Avery Elle Blog Hop. In addition, you will receive the Homemade Gift Ideas and Holiday Spa Recipes CD filled with exclusive gift ideas and recipes for your Holiday Spa Gift Giving needs. Stay tuned, during the blog hop you will receive one AMAZING spa recipe for free. Order your Avery Elle Blog Hop Pack today and receive EXCLUSIVE PDF TUTORIALS using Avery Elle Products and Add a Little Dazzle Craft Metal Sheets. This offer is ONLY available this week. Order your Avery Elle Blog Hop Pack today! Oh my! This is gorgeous!!! LOVE how much WOW factor the Add A Little Dazzle metal sheets add to this!!! TFS! Stunning card and your sentiment warms my heart. The embossed metal is so fabulous. Beautiful card! I love the look of the metal sheets embossed… have to try that! Love the top stamp combined with the embossing below. So pretty! I love the colors and the design. cute card! Love the shine!! I like the snowflake embossed metal accent. Terrific sentiment and the embossed metal is fabulous!!! Beautiful. I love the blue used in the card. The embossing is so pretty. Love the colours on this card L-A! I am beginning to love the embossed metals just as much as the “smattering” of sequins. Good luck with your very noble goal to use up your paper collection before buying more. Hope it works. It doesn't seem to work with my bead collection. Tee Hee. What a lovely card. I love the aqua colors you used. The sentiment is so perfect for a winter card. Just what people need to hear on a cold winter day. Well done. LOVE your “Love”, pretty colors, SWEET sentiment and embossed snowflakes!!! very very pretty, love the color selection and the background stamp.